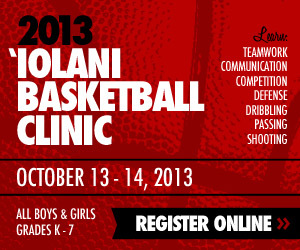 The Hawai’i basketball team now knows what it takes to win on the road. The Warriors will need to do it again on Thursday at UC Riverside if they want to make a run toward the top of the Big West Conference. Hawai’i will open the second round of games in the Big West regular season with a road contest at UC Riverside. The game is scheduled to start at 5 p.m. (Hawaii time) at the SRC Arena in Riverside, Calif. The Warriors are 11-9 overall and in a three-way tie for third place in the Big West at 5-4. The Highlanders are 5-15 overall and in ninth place in the conference at 2-6. Hawai’i’s largest margin of victory in the first round of Big West games was a 76-61 win over UC Riverside on January 5 at the Stan Sheriff Center. “We handled them fairly easily the first time they came in here, but they’ve improved a lot,” Hawai’i assistant coach Scott Fisher said. Since its loss at Hawai’i, UC Riverside is 1-4, but the four losses have been by an average of 5.8 points. Included in that stretch is a 91-82 loss in overtime to first-place Long Beach State. The Warriors and Highlanders are similar in that both teams like to get the ball into the post. Riverside’s top player is Chris Patton, a 6-foot-10 junior center who is averaging 12.4 points and 5.6 rebounds per game. 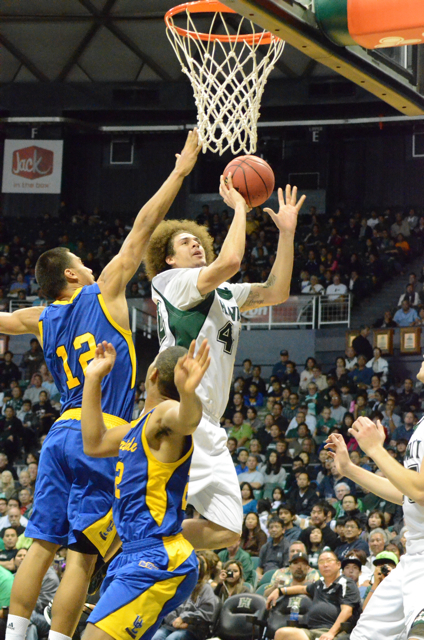 In Big West play, he is averaging 15.4 points with a .675 field goal percentage. The Warriors held Patton to eight points on 3-of-8 shooting in the game at Honolulu. Riverside’s other top scoring threats are forwards Chris Harriel and Josh Fox. Harriel, a 6-4 junior, is averaging 10.8 points per game and leads the team with 28 3-pointers; Fox, a 6-6 freshman, is averaging 10.5 points and 6.8 rebounds per game. The Warriors have an even bigger – and more productive – frontline. Forward Christian Standhardinger leads the team in scoring with 15.5 points per game and is second in rebounding at 7.7. The 6-8 junior is coming off his career best game – 31 points and 16 rebounds in a breakthrough road win at UC Santa Barbara last Saturday. Vander Joaquim, a 6-10 senior center, is averaging 14.0 points and 8.4 rebounds per game. He had 11 points and 11 rebounds in the previous win over Riverside. Isaac Fotu, a 6-8 freshman forward, is contributing 10.2 points and 6.8 rebounds per game, and leads the Big West with a .625 field goal percentage. The difference in the first meeting was Hawai’i’s outside shooting. In particular, freshman Brandon Jawato scored 21 points on 7-for-7 shooting from 3-point range. It would also help if the Warriors can keep the Highlanders below their current averages. Riverside ranks last in the Big West in scoring (60.9 per game), field goal percentage (.425), 3-pointers (4.7 per game), 3-point percentage (.283) and free throw percentage (.575). Riverside’s free-throw percentage ranks 343rd out of 345 NCAA Division I teams. A big difference from the first meeting between the teams in Honolulu will be the atmosphere. When the Warriors beat the Highlanders four weeks ago, the attendance in the Sheriff Center was 6,214. Riverside is averaging just 627 fans per home game, and has drawn a combined total of 5,018 fans to its eight home games this season. Where: SRC Arena (2,750) – Riverside, Calif.
Radio: ESPN 1420 AM will carry the game live. Neighbor islands can listen live on KNUI on Maui, KHLO in Hilo, KKON in Kona, and KTOH on Kaua’i. Defense and win the rebound battle. Get a lot of Offensive boards, reset on O and putbacks. Pressure, traps, etc. Play to win, and don’t be careless with the ball. PLAY BIG BOY BB guys, you can win. Seniors and Jrs lead, freshman will follow your effort for 40 minutes. GET THE W! Several of the Better Teams NOW in the Big West — Cal Poly & Long Beach included — had “OFF” years in the last three/four years WHEN THEY Had Big Incoming Freshmen Classes — Similar to this yearʻs UH Team they HAD TO Learn to Focus & Play 40+ At the D-1 Level -. i had hoped that D-1 Experience (Vander @UH, Jace @ Utah, Christian @ Nebraska, Spearman @ Dayton) would have triggered faster team learning or More Performance Consistency…MAYBE All That IS Kicking in and Overcoming Now…Itʻs Not Unusual for JC Recruits (like Hauns) to kick in somewhere in the second year…. Must Apply Enough Energy, Effort, Skill, Execution & Smarts, etc…. Win tonight and UH is in 3rd place outright. Lose and they fall way down to 7th place. One game can make a big difference. 5 teams currently have 4 losses, including Hawaii. It would be a bad sign if we lose this one. Win and at least the team is in decent shape with an opportunity to win on Saturday at Fullerton. But, Fullerton wants revenge badly after losing to UH on Jefferson’s buzzer beater. That’s not going to be easy by a long shot. Every possession must be valued. Every single free throw attempt could make the difference, every block, every steal, every turnover, every travel, etc. etc. Everything is magnifield. If the big guys dominate the boards and turnovers are kept to a minimum, UH should win this game just from the height advantage.